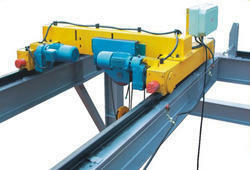 Leading Manufacturer of electric cranes from Ghaziabad. We are leading manufacturers and suppliers of Electric Cranes to our clients. Electric cranes are fabricated using premium quality raw material and designed using latest cad facility to suit the clients requirements. Our engineers and researchers carefully study and do detailed analysis of clients requirements before deciding the suitable design.